Propane gas that is. And I'm not out yet but very low. I took my 7 gallon tank to get refilled at the usual spot but they wouldn't fill it because my tank needs to be re-certified. I didn't know it had to be re-certified every 5 years or something like that. The guy said that I had to take it in to town to the propane company. I don't have time for that right now so I have decided to let my tank run out. When it does I won't have a freezer or a stovetop to use in the RV. 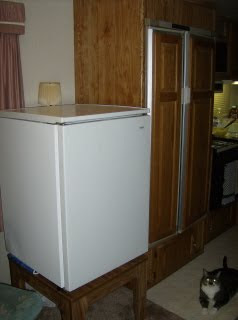 But now that I have my vinyl flooring in my mobile home, my other fridge is in the right place and I plugged it in. When my RV fridge dies I will have to move my freezer food in to the mobile home. I was planning to do that anyway in a month or two. This is just going to speed things up a bit. I do have an electric mini-fridge in the RV so I can keep things cold but not frozen. I have an electric 2-burner stovetop in the mobile too. I don't have a place set up for it yet but I soon will...hopefully before the propane runs out. All of this wouldn't be an issue if my RV fridge still worked on electricity because I could have lasted 6 months or more with only my stovetop using propane. Oh well, I'll add re-certification of propane tanks to the long list of chores that need to be done before the RV is sold including replacing the fridge circuit board so that it works on electricity again, buying new batteries, fixing the handles on the holding tanks and replacing the plastic trim around the outside. I'm not going to worry about those things until the Fall. I have more important projects right now. I assumed you meant running out of energy, which would be quite understandable too. At least there is a work around for this and it might even get you moved into the mobile home a bit quicker. Another change to the blog title soon when mobile home replaces RV? I also thought you meant running out of energy, but it sounds like you have plenty of that, just not nearly enough time. Good luck with everything. I'm always nervous about replacing gas/propane because I assume I'll forget and run out at an inopportune time. . .the extra step of getting recertified would probably make me even more likely to run out of gas. Over the Cubicle, definitely not enough time. I wish I had enough vacation so I could take the whole week. Simple in France, I know what you mean. I bet my propane will run out in the morning right after I leave for work. Maybe I should eat all the ice cream now...it's a good excuse I think.